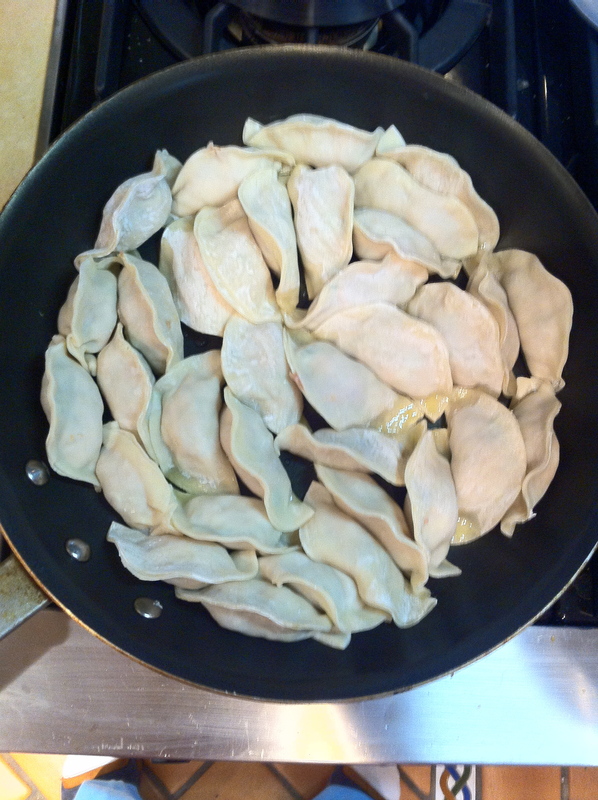 I’ve never made pot stickers and I’ve always wanted to try so…I went online and did some research and I found a couple of recipes I liked. 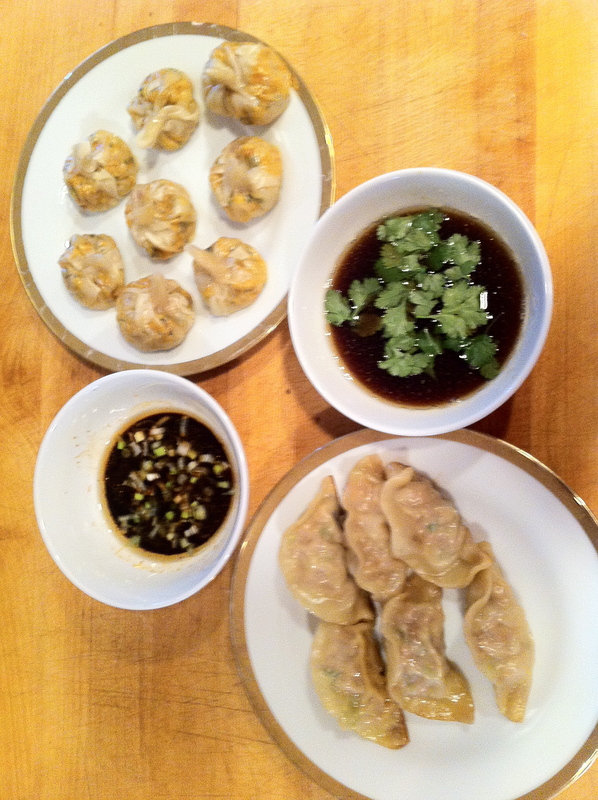 I decided to make two batches of Chicken, and Pork pot stickers. I had some left over Pork shoulder that I chopped into cubes froze for about an hour and ran through my meat grinder on a number 2 blade. Then I followed the recipe. 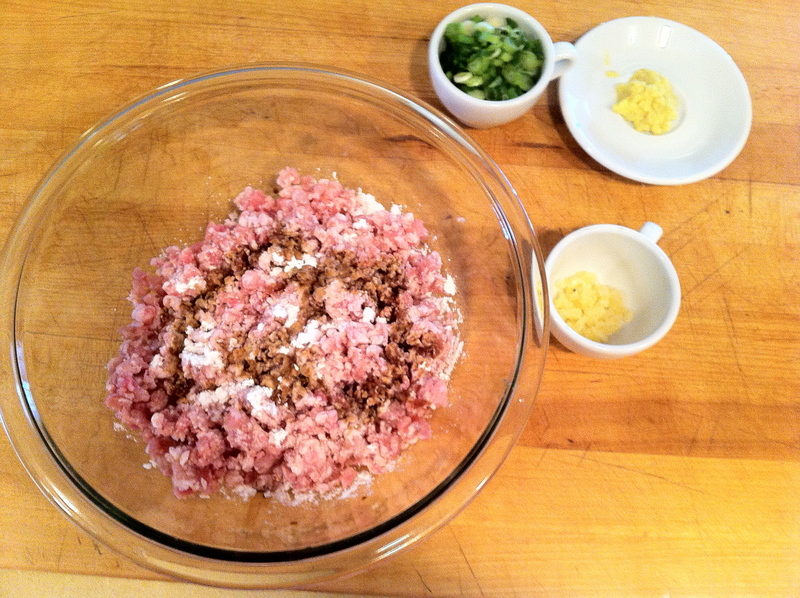 In a small mixing bowl I combined the ground pork, green onions, ginger, garlic, cornstarch and soy and mix thoroughly. 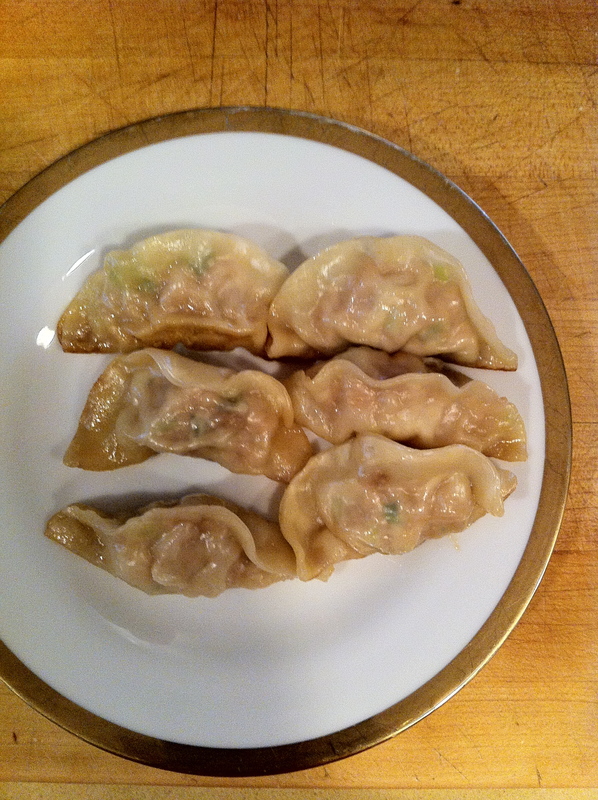 Working in batches, I laid the gyoza wrappers on a clean, dry surface and placed about 1 tablespoon in the center of each wrapper. Moisten the edges with water, and brought the edges together at the top so that they met. * So, it took me a bit to get this down…Basically its like licking an envelope and sealing it! 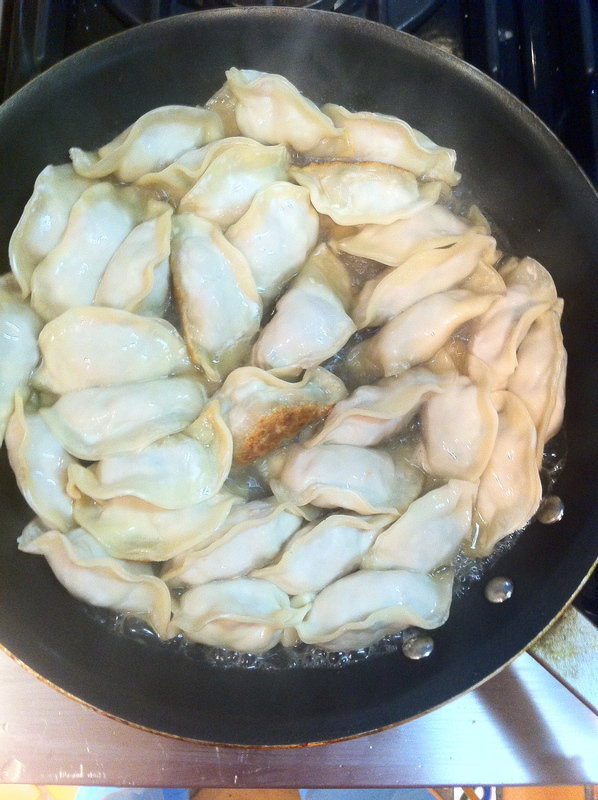 In a large nonstick skillet over low heat, I added the vegetable oil and, when hot, added the dumplings and cooked them until they were golden brown on the bottom, 1 to 2 minutes. * Are the pot stickers a tad bit crowded in the pan?? YES!! Then I added the chicken stock, reduced the heat to low, and covered the skillet. 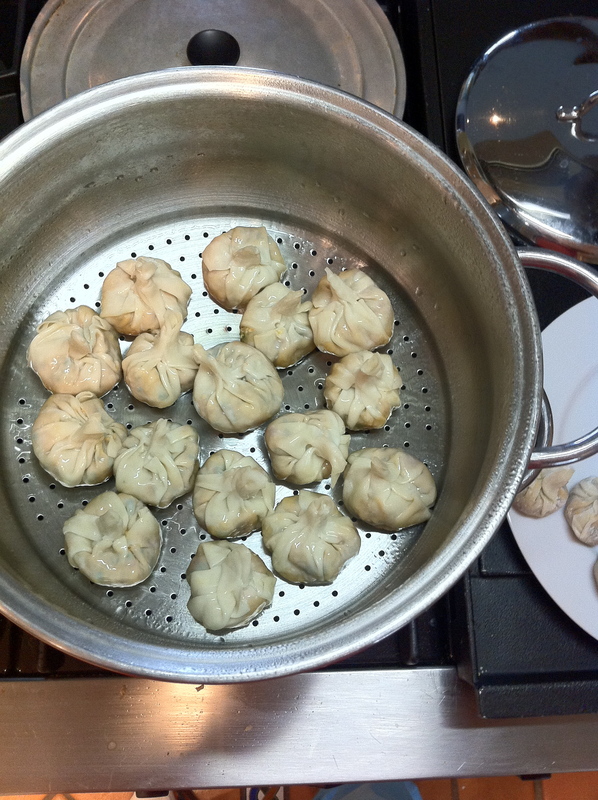 I cooked the dumplings until the wrappers were tender and the filling cooked through, 3 to 5 minutes. I had to add a bit of additional stock to the liquid as it had evaporated before the dumplings were finished cooking. 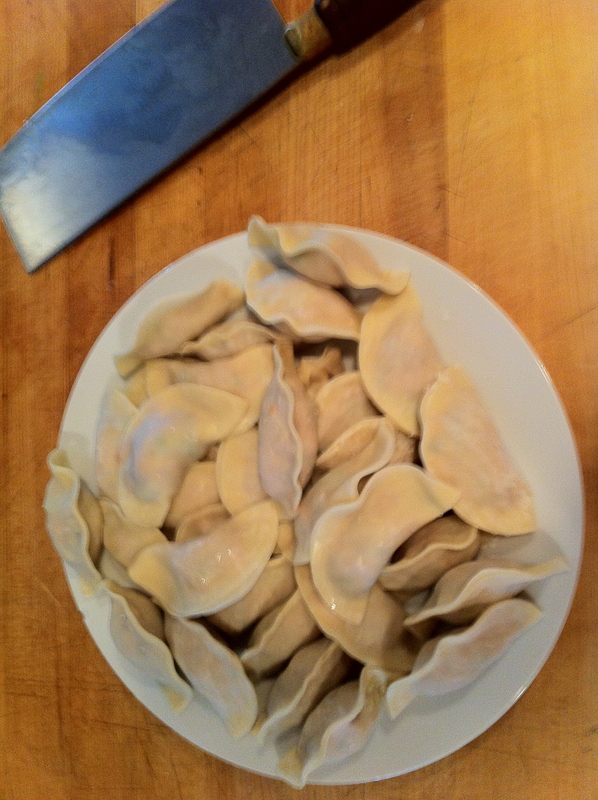 And here’s the finished product of my first ever Pork Pot Stickers! 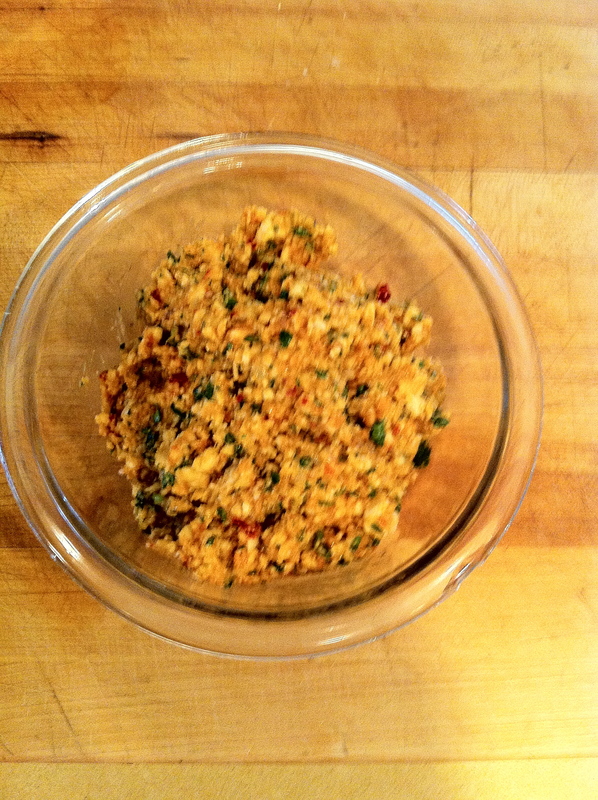 I made the dipping sauce per the recipe and…DAMN were they good! Next, the chicken pot stickers. Puree ingredients in a food processor for 1 minute. Serve at room temperature. In a hot pan I sautéed the ground chicken, garlic, ginger and shallots together until the chicken was thoroughly cooked. 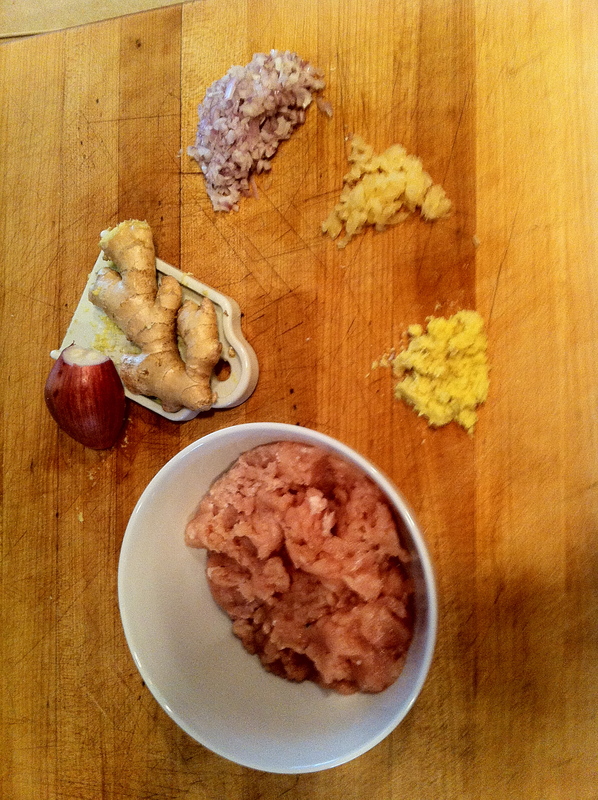 I drained off the excess fat and chilled the chicken meat. 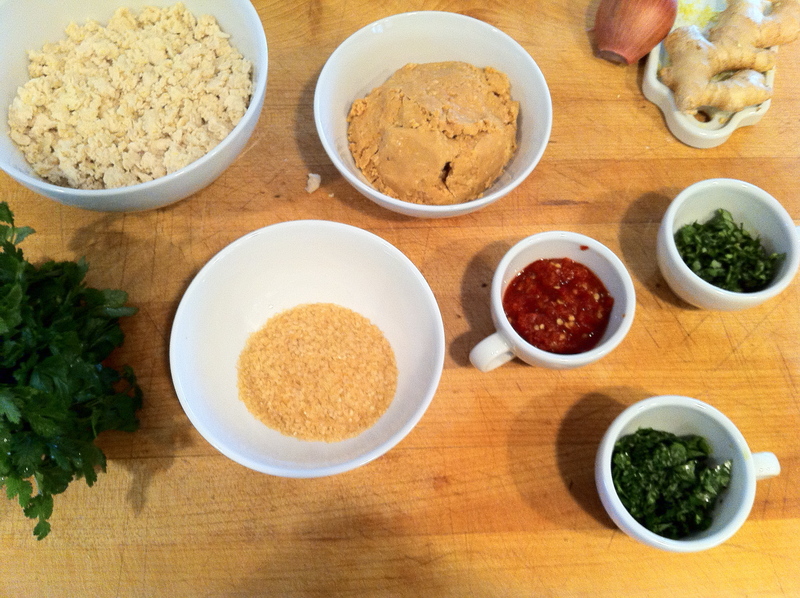 I then mixed the chicken together in a bowl with the peanut butter, brown sugar, chili paste, basil and cilantro. I took the chilled mixture and wrapped it in the wonton wrappers. I felt the wonton papers I got were too thin. I also put way too much of the chicken mixture into the wrappers…ANYWAAAAAAY. I sealed and then steamed them in my couscoussier. I brought the water to a boil, steamed the pot stickers for about 8 to 10 minutes until the wrappers were translucent…And here they are! * A quick note. The chicken pot stickers were way too sweet for my taste. I would also use about half the peanut butter in the recipe. Also, I hated the sweet sauce recipe and much preferred a savory spicy sauce similar to the one I made for the pork pot stickers. 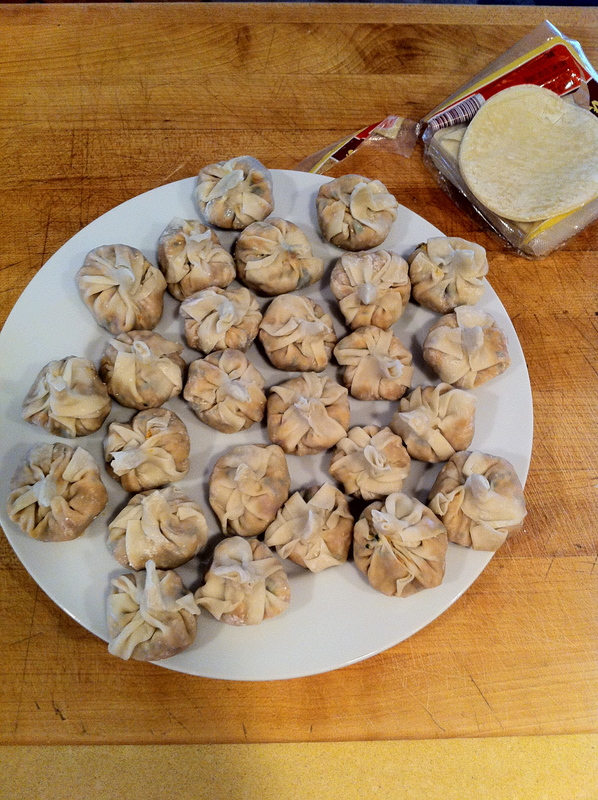 This was my first attempt, but next time I’m going renagade…Lambs tongue, and Beef cheek pot stickers! That’s how I rollllllllll !!!! beeeeef cheeeeeks! everybody say beeeeef cheeeeks!! hey, great job on the podcast last night, stayed up and watched it live, you were hilarious as always, glad you plugged the food blog! Heard your talking about your blog on Adam Carolla’s podcast. Have been a fan for a long time but now that I know that you love the pork and you love to cook – I’m in love!! DAG-A-Roni! In terms of the wrap itself, did you prefer the half-moon shape or the purse shape? I’ve had trouble getting a good seal on the half-moon. Also, have you tried making your own wrappers? Getting a consistent thickness has been an issue for me as well…for the wrappers. That’s pretty damn strong right there…. YUM! Love that you did these 2 different ways…I always buy them frozen from Trader Joe’s because I’m to afraid to try from scratch…hrm, I think I can do this…. DAG! Saw you on the Adam Carolla UStream broadcast. Love the blog. Keep up the good work. The pork pot stickers look right up my alley. I haven’t found a better one than the Chinese place down the street from my house in St. Paul, MN. I am going to try your recipe and report back. I as well have only made frozen ones at home. This is a fun little cooking blog you have here. Thanks for the plug on Carolla’s show or I never would have found it. I’ll have to try these. They look delicious. You make it look easy. I’m definitely going to try your recipe. Oooo, can I have your recipe for pierogies, please? My husband is polish and we both LOVE them! Thanks! I am going to try it for my family. Will you try bee next time?